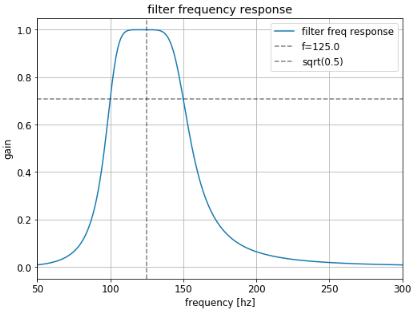 Why does a higher sampling frequency mess up my bandpass filter? I was designing a bandpass filter in python using some of the scipy.signal modules. I am plotting the frequency response of my filter to verify that my desired frequency is in the passband. However, when I make the sampling frequency larger, the frequency response of my filter gets completely messed up. I currently have a signal that I sample >300KSPS and am trying to create a bandpass filter for some fairly low frequencies (1-100hz). Could somebody explain why this happens? You might benefit from splitting this into second-order sections. The easiest way is to use output='sos' and sosfreqz() and sosfilt(), which handle the splitting automatically. These second-order section functions should be the first thing you try, actually. They didn't exist in scipy until recently, so they aren't the default, for backwards-compatibility, but should always work better than output='ba', lfilter, etc. With an IIR filter, the higher the ratio is of sampling frequency to bandpass filter frequency, the closer the poles are to the complex unit circle in the Z-transform. 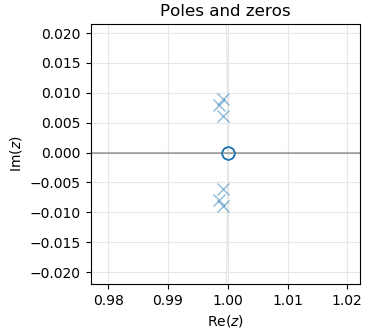 Poles close to the unit circle can produce numerical instabilities (ill conditioned computations) when computing the filters response. This is because any numerical quantization or "rounding errors" can get amplified in the arithmetic recurrences if there is only a tiny difference in location between the pole and the unit circle, even if the pole is "supposed" to be inside. 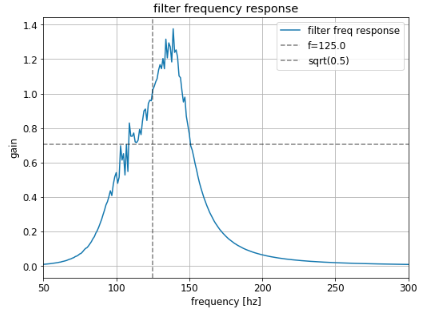 A better solution is to first downsample the signal before filtering to use an IIR filter that is possibly of a lower order and more stable. You can upsample back up, if needed, after the filter has been applied. Not the answer you're looking for? Browse other questions tagged filters python bandpass nyquist scipy or ask your own question. Design and implementation of causal band-pass filter for biosignals - what to consider? Why is the second-order-section cascade approach giving “worse” results?